Cake toppers - what to choose. Do you want to make your wedding cake really stand out? 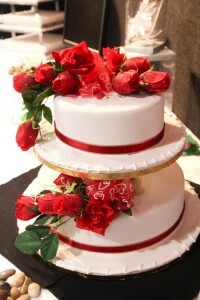 The wedding cake will be the table centerpiece and a major focal point of the wedding. Therefore it makes sense to spend a little extra time to get a special wedding cake topper. 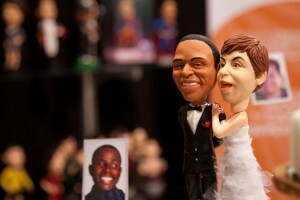 Humorous wedding cake toppers can really be an eye catcher and a great conversational piece for the wedding reception. 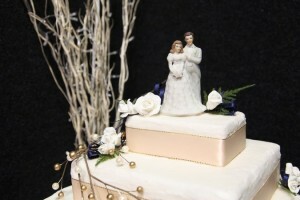 There are a wide variety of wedding cake toppers to choose from and a variety of sources where they can be purchased. If possible one of the quickest and easiest ways to get a unique wedding cake topper is from the bakery where the cake is bought. However the stock of wedding cake toppers at a bakery might be limited. If this is the case one of the best places to turn is the internet. You can either go with a company that focuses on unique wedding decorations or try searching on trademe. There are now numerous companies online that will even make custom wedding cake toppers. One of the best ways to make your wedding cake topper, is to get a custom topper infused with your personality. This makes the most individual and fun cakes, either a joke cake topper, like where where the bride is dragging the groom to the alter, or one than is a created from the bride and grrom’s interests and hobbies. Do you both love getting out for a round of golf? Or is mountain biking a big part of your life? Whatever your hobbies are try incorporating one of them into your wedding cake topper this can make for a unique topper. If you are planning on getting a custom made topper based on your own charater, then you will want to have a few good quality pictures of yourself in a digital format. You can then send these pictures into the company so the sculptor of your topper can fashion the bride and groom to your likeness. Cake toppers for your wedding.